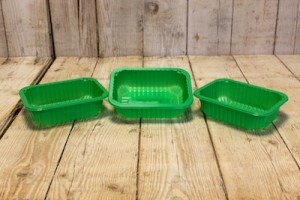 In collaboration with Promessa from the Dutch town of Deventer, several members of the supermarket chain SuperUnie (including Coop and Poiesz) as well as EkoPlaza will switch to completely compostable and renewable meat trays by Bio4Pack to package organic meat. The tray, transparent film, label and absorption pad will all be bio-based and compostable according to the EN-134342 norm, as well as indistinguishable from traditional meat packaging. Bio4Pack started development of this organic tray back in 2006, and managed to keep its costs only a fraction higher than those of a traditional plastic tray. ‘It was quite a challenge. PLA is more fragile than other types of plastic, which means you have to add approved impact additives to the mix. In addition, the material must have good barrier properties and the packaging should be able to be mechanically processed with ease. However, the green colour was the biggest hurdle,’ according to Patrick Gerritsen. An added benefit for retailers is that they will have to pay virtually no packaging tax for them.